The Harrovian is the School's weekly newspaper, produced by the boys. It includes news, sports results, features and comment articles and dates back to 1828. The Harrovian newspaper, like its previous incarnations under different names, is an invaluable resource for historians, capturing not only details of School life, but also the concerns of the wider world which are reflected in the articles written by boys and staff, providing a fascinating insight into social history. For those who are descended from or related to Harrovians, who wish to find out more about their relatives, this resource may provide some insight into their lives and characters – as long as they were mentioned in the School newspaper. This website provides access to back issues of The Harrovian newspaper, in all its incarnations, covering the last 180 years or so. Every issue has been digitally scanned and stored, and the text has been categorised and put into a searchable database. Using the search facility, visitors can search by year, by keyword, by a name or even by category (sport, music etc.) and the database will provide the issues of the newspaper which include the search terms. This facility is open to the public for a small charge, but is free to members of the Harrow Association. It has been provided and funded by the Harrow Association, in conjunction with the Harrow School Archives. 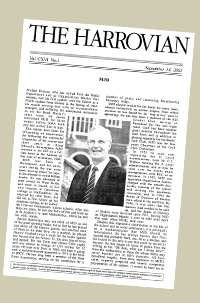 If you would like any more information about The Harrovian, or you have any questions about this website,Digital Information Manager, Luke Meadows, on meadowsl@harrowschool.org.uk or for further information about Harrow School’s Archives, please contact the Archivist on archives@harrowschool.org.uk. If you are an Old Harrovian or member of the Harrow Association, please contact Luke Meadows for a username and password to access the archive.